As midnight approached on October 19th Canadians staying up to watch the results of the federal election let out a huge collective sigh of relief as the Liberal party under 43- year-old pretty boy Justin Trudeau surged to an unexpected majority victory, putting an end to nine years of Conservative rule under Stephen Harper which had threatened to turn Canada into a warlike, paranoid extension of the United States. “We’re back!” a beaming Trudeau announced at a rally in Ottawa the following day, nourishing the hopes of peace-loving Canadians, many of whom had begun to joke about removing the maple leaf insignias from their luggage out of shame when traveling abroad. MidEast watchers in particular saw their hopes rise throughout the two-and-a-half month federal campaign (the longest since the 19th century), during which Trudeau promised to admit 25,000 refugees to alleviate the crisis in Syria. (The Harper government proposed admitting only 1,400, citing fears that terrorists might be among them.) 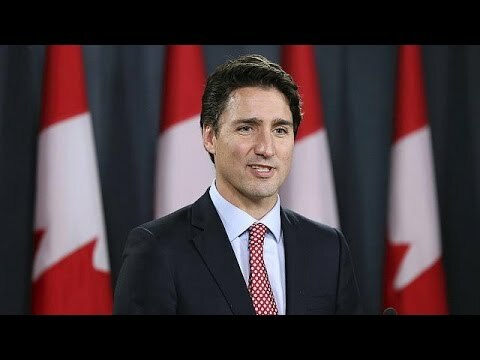 Trudeau vowed to end Canada’s combat mission against ISIS, and was moreover the only leader among Canada’s five major national parties to directly promise to restore relations with Iran, which the Harper government unilaterally severed in 2012 under the bogus pretext that Iran’s cultural attaché in Ottawa was promoting Islam (it is a cultural attaché’s job to promote culture!) and citing baseless fears for the safety of Canadian diplomats in Tehran. This counterproductive gesture left some 400,000 Iranians resident in Canada without access to consular services, and led confused Canadians to surmise that under the dark of night our government had sworn in a new foreign minister by the name of Binyamin Netanyahu. While throughout the campaign the Middle East was rarely discussed, Trudeau’s positions set him distinctly apart from other party leaders. In the wake of Harper’s strongly partisan pro-Zionist policy, the election of the Liberals promises a return to the more balanced approach to the Israel-Palestine conflict which characterized earlier Canadian administrations. (During the recent election cycle even the formerly socialist New Democratic party refused to distance itself from the Harper regime’s uncritical support for Israel, NDP leader Tom Mulcair even going so far as to dismiss several of his party’s candidates who had been bold enough to criticize Israeli human rights violations). The Trudeau government has yet to name a cabinet (though former astronaut Marc Garneau, who previously served as the Liberals’ foreign policy critic, is a likely candidate for Minister of Foreign Affairs), and its positions may be more fully fleshed out by the time Trudeau attends the G20 summit in Turkey on November 15 and 16. The incoming Prime Minister has moreover invited provincial representatives to accompany him to the climate summit in Paris in December, where all eyes will be on him to see if he succeeds in restoring Canada’s place as a leader in the fight against climate change after the embarrassment caused by Harper’s refusal to sign the Kyoto treaty. Canadians have emerged from a nine-year nightmare in which they saw their global reputation for peacefulness and moderation trampled under by a Conservative government that thrived on sowing fear and restructured the national economy in the service of the world’s dirtiest oil industry. It is time to dream again. Richard Foltz is Professor of Religion and Founding Director of the Centre for Iranian Studies at Concordia University in Montréal, Canada. His book Iran in World History has just been published by Oxford University Press.